You know ASI? ASI can give you something very powerful in a small package. ASI can run a powerful AI in just my pc. Hi Korrelan, your work is very fascinating, I have read your blog and it seems you've made incredible strides towards AGI! Are you planning on releasing any part of your engine/emulator/NN for others to build upon? I know you are writing a book, are you planning on putting a lot more detail and mathematical explanations of your model in there? Thanks, looking forward to future updates! Yeah! I will be looking into GPU eventually but ATM I’m messing around with machine consciousness. I think I have a GTX 980 some where… I’ll check. Currently I’m experimenting to see how much ‘intelligence’ I can squeeze out off a limited number of neurons/ synapse. I’ll be posting some vids of machines screaming in pain and confusion soon lol. ASI = Artificial Super Intelligence? I’ m not sure what you are saying lol. Glad you like my work so far. I’m writing two books; one on human neural function/ theory and a second on actually creating/ coding machine consciousness/ intelligence. Both have around 200 odd pages ATM… I really need to pare them down lol. I spose, the less neurons you need the better. Im working on something a little secretive in the performance area of slower computers, and ive nearly got it going. You're going to offer them as ebooks for those nice, rainy day reads right? So korrelan tell us what you foresee as the steps you will take to reach an AGI. What level will come forth first? Then, what? And then what? Are you first cracking Language?? Anyone notice anything weird about this picture. what is it, no dif? Yeah! 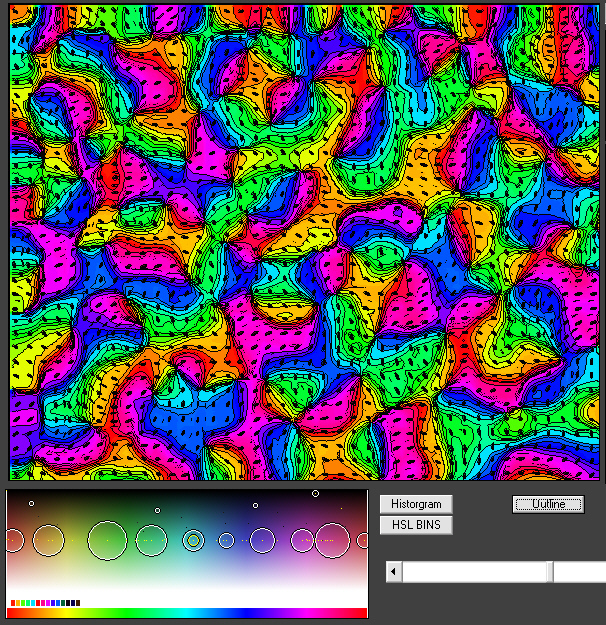 The image is a orientation/ depth map. I noticed my AGI was mapping some colours to distances, which seemed like a strange thing to do. This is a representation of how the AGI is 'experiencing' colours... and it does look to me as though it has a kind of 3D depth. I wondered if anyone else could see the effect or if it was just my eyes playing tricks on me. It might be my colour blindness effecting me, I see the blues as deeper/ father away than the greens. oh! i thought it was an orientation map. well it is... but i thought it was an orientation map to rotate the network to the right spin when doing id'ing. so its experiencing colours. I wonder if the appearance of depth for human viewers is a psychological artifact of looking at terrestrial maps. Maybe the blue areas come across as "water" and the green ones are "hills." You are correct. The same/ similar topology is generated as a rotational/ orientation map. Because my AGI’s visual cortex is based on the mammalian ocular schema colour is mapped in a very similar way. You may be correct about the deep water, high green land masses. I've asked several people if they experience the same illusion of depth when they view the image and the general consensus is… no lol. I actually see a 10mm ish difference in the depth field between the green and blue. For me it’s like a shallow hologram… this is obviously a phenomenon from my colour blindness and I've never before experienced this type of optical illusion. It’s just so pronounced… its deff weird. It just struck me that the AGI was mapping colours to distance and when I viewed the back engineered map, I too saw depth lol… I think I'm spending too much time in front of my monitors lol. Edit: In hind sight the mapping of colour to distance kind of makes sense. The machine has been observing many different images including ‘real life’. So perhaps blue skies, water/ oceans = distant and green grass etc in the foreground = closer (as WOM suggested). It could be a side effect of ‘seeing’ an unbalanced/ bias set of visual experiences at this point in its development. I too saw the green as hills in a topography and blues as a depth or water. I'm color deficient as well. Not color blind, because I see colors but there is a confusion between shades of colors like olive green etc. and tan's or brown. I have a friend who is Green / Red color "blind". He drives but knows that the green light is always on the bottom. Solved it... it's a form of chromostereopsis... who knew lol.